IARE enjoys geographical advantage as it is well connected by air, rail, and road transportation. The institute is situated at Dundigal, adjacent to Nehru Outer Ring Road (ORR) off Medak - Narsapur junction exit - 5, making it accessible to several important centers in and around the city. The institute is 20 km away from Secunderabad Railway Station, 11 km from JNT University, Kukatpally, Hyderabad and is just a 40 minute drive from Rajiv Gandhi International Airport at Shamshabad. It takes 60 min from Chilakalaguda / Secunderabad Bus Station to Institute of Aeronautical Engineering using Bus No ‘230D’. TSRTC runs a total of 26 daily trips from Chilakalaguda towards Air Force Academy route. 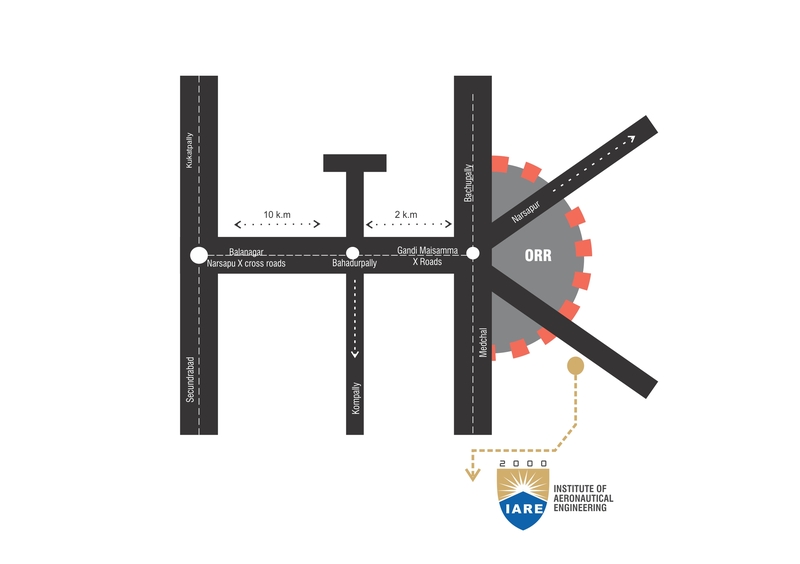 It takes 80 min from Central Bus Station (CBS) to Institute of Aeronautical Engineering using Bus No ‘230X’. TSRTC runs a total of 5 daily trips from CBS towards Dundigal route. 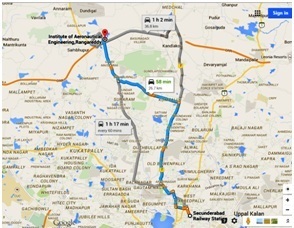 It takes 120 min from Kachiguda Bus Station to Institute of Aeronautical Engineering using Bus No ‘83J/230’. TSRTC runs a total of 6 daily trips from Kachiguda Bus Station towards Dundigal route.